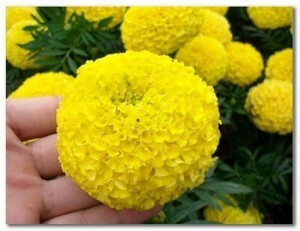 This super marigold variety produce showy, honeycomb shaped flowers held on sturdy 1 foot plants. 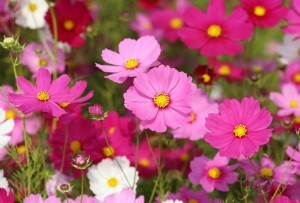 The blooms are compact and uniform, are are heat and rain resistant. In India bright yellow and orange marigold flowers are used by the thousands in garlands and to decorate religious statues and buildings. They are also used as offerings and decoration at weddings, funerals, and other ceremonies. Your choice of Yellow and Orange. 1 oz contains ~9000 seeds. (Tagetes erecta ) Marigolds are among the most popular and easiest to grow annuals, blooming all summer until fall frost. In India bright yellow and orange marigold flowers are used in their thousands in garlands and to decorate religious statues and buildings. They are also used as offerings and decoration at funerals, weddings and other ceremonies. 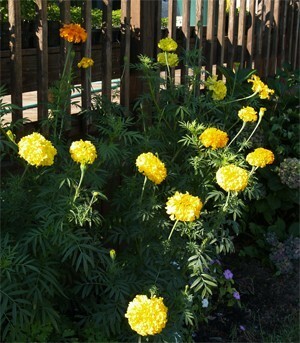 This tall type, produces large yellow, orange, and gold carnation like flowers. Ideal anywhere height is needed, including against walls, fences, and as a cut flower. 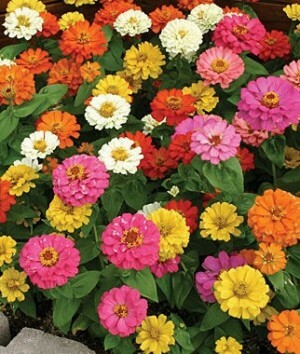 (Zinnia elegans) Giant blooms - up to 5" (12 cm) across - The flat-petaled semi-double flowers are displayed on long, graceful stems all summer and into fall. The mix includes a full range of earthtone colors. Plants are easy to grow and come into flower quickly. Use in mass plantings and mixed sunny beds. Excellent for cutting. 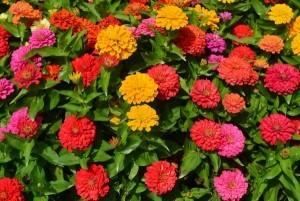 A dwarf Zinnia variety (6 inch plants) with semi-double and double flowers. Excellent for containers, borders and gardens with less space. 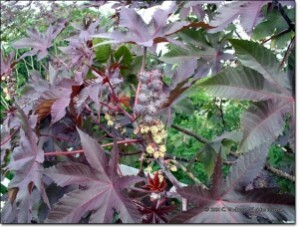 (Ricinus communis) The castor bean plant has been cultivated for centuries for the oil produced by its seeds. The plants themselves are very impressive. Their huge, lobed, star-shaped leaves can reach 3 feet in length. They look attractive in groups, or as individual specimen plants. Each plant grows very rapidly with little care or insect pests and produces a mass of lush tropical foliage. A great accent plant for any garden. 5 seeds/pkt. An appealing mixture of bright warm toned flowers. 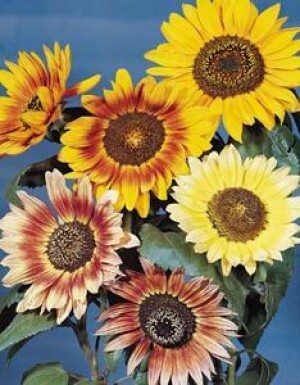 The strong stemmed blooms grow on tall plants producing an abundance of cut flowers. Rich shades of orange, yellow, bronze, and red on multibranched plants. More colorful than the standard yellow sunflower. Use as a backdrop for shorter plantings, as a temporary hedge or for color in the vegetable garden. (Mirabilis jalapa)The plants of this variety are lush and bushy to three feet. 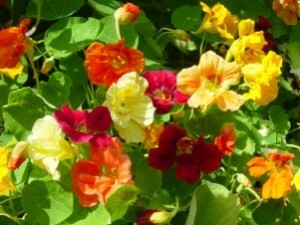 The tubular flowers bloom in iridescent purple, white, red, yellow and striped. Their name derives from the fact that their flowers open in the late afternoon and stay open until the next morning, except on cloudy days when they open earlier. The fragrance of four-o'clocks is also appealing. 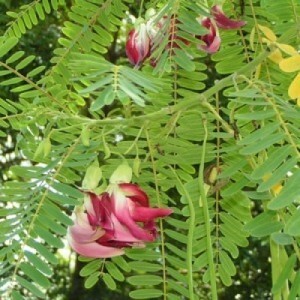 In India, is has medicinal uses. (Polianthes tuberosa) has tubular blooms and a fragrance that is described as rich, sultry and seductive. The oils extracted from the flowers are used to make perfume. Bulbs can be planted in spring and will flower in late summer. Plant 2-3 in. deep and 1 foot apart. In USDA zones 8 and above the bulbs may be left in the ground. Everywhere else the bulbs can be dug up in the fall, allowed to air dry for three to five days. and stored in sand or peat moss. It also makes an excellent potted plant and can be kept indoors during the winter. Rajnigandha bulbs are available as single flowered variety (1 row of petals) or double (multiple rows of petals). In Bengali, it is called "Rajoni-Gandha", In Urdu "Gul Shabbi", In Marathi, "NishiGandha", Sugandharaja in Kannada, in Tamil "Sambangi" or "nilasambangi", and in Telugu "NelaSampenga" and the flowers are traditionally used to make garlands especially in South Indian weddings.